We recommend checking out our discussion threads on the Cartoni Focus Head 125 & STABILO Tripod Legs with Bag F135, which address similar problems with connecting and setting up Tripod Systems Cartoni. The user manual for the Cartoni Focus Head 125 & STABILO Tripod Legs with Bag F135 provides necessary instructions for the proper use of the product Professional Video - Tripods, Supports & Rigs - Tripods & Accessories - Tripod Systems. 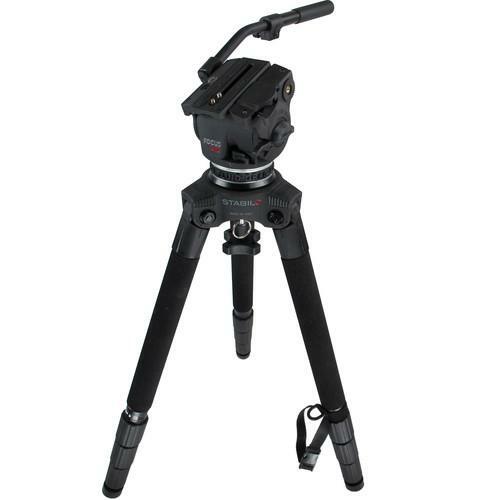 Cartoni's Focus Head 125 & STABILO Tripod Legs with Bag is an all-in-one bundle including a fluid head, carbon fiber tripod legs, and carry bag, suitable for cameras and accessories weighing up to 26 pounds. The head features a sliding balance plate for balancing your camera on the head. The head also incorporates a variable counter balance with variable pan & tilt drag adjustments. The head and legs use a 100mm ball/bowl for quick leveling without adjusting the legs, and the 100mm base provides a wide support platform for your camera. The 3-stage carbon fiber legs provide a stable torsion resistant platform that supports smooth camera moves throughout the height range of 8.8 to 71.9". The independent leg adjustment allows you to lock each leg in one of three positions, which comes in handy when shooting in odd shaped spaces. The tripods feet incorporate spiked feet that provide good purchase on soft exteriors or beaches, while spin down rubber covers protect delicate surfaces from the spikes. Rounding out the bundle is a soft case for transport or storage. Box Dimensions (LxWxH) 20.0 x 8.6 x 8.3"
Box Dimensions (LxWxH) 36.5 x 8.9 x 8.6"
Box Dimensions (LxWxH) 19.0 x 12.0 x 8.2"
The user manual for the Cartoni Focus Head 125 & STABILO Tripod Legs with Bag F135 can be downloaded in .pdf format if it did not come with your new tripod systems, although the seller is required to supply one. It is also quite common that customers throw out the user manual with the box, or put the CD away somewhere and then can’t find it. That’s why we and other Cartoni users keep a unique electronic library for Cartoni tripod systemss, where you can use our link to download the user manual for the Cartoni Focus Head 125 & STABILO Tripod Legs with Bag F135. The user manual lists all of the functions of the Cartoni Focus Head 125 & STABILO Tripod Legs with Bag F135, all the basic and advanced features and tells you how to use the tripod systems. The manual also provides troubleshooting for common problems. Even greater detail is provided by the service manual, which is not typically shipped with the product, but which can often be downloaded from Cartoni service. If you want to help expand our database, you can upload a link to this website to download a user manual or service manual, ideally in .pdf format. These pages are created by you – users of the Cartoni Focus Head 125 & STABILO Tripod Legs with Bag F135. User manuals are also available on the Cartoni website under Professional Video - Tripods, Supports & Rigs - Tripods & Accessories - Tripod Systems.